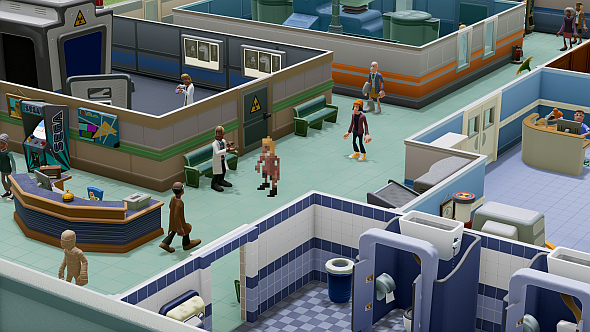 Two Point Hospital wants to be more than a new Theme Hospital – is it? Would I like to accept a busload of VIP patients stricken with Portishead? Would I ever! My cure rate is high and so is the financial return. Health is a business, after all. But do I have the capacity? I click ‘yes’ to accept the event and the sounds of sickness – farting, burping, and coughing – punctuate smooth jazz as I expand my ward and add more beds. A column of cartoon characters with police sirens flashing over their heads traipses through the corridors, taking up space on the ward and being fussed over by nurses. We accommodate them, treat them, and take their money. My bank balance spins upward, pleasingly. The best management sims can make you feel like this: like you’re building a machine. 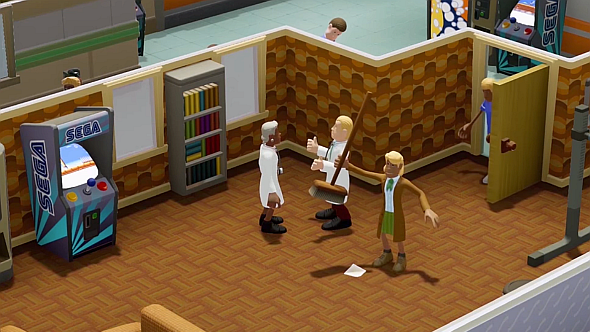 Two Point Hospital’s diseases are funny, but only because they’re not real. What if they were? Admittedly, it’s not a very complex machine just yet. I’m only playing Two Point Hospital’s first scenario and the training wheels are most definitely on: a generous starting bank balance means I can build whatever I like without having to worry about bankruptcy, I don’t see anyone complain about systems like temperature or aesthetics, and staff only have their minor personality traits unlocked, so I don’t have to worry about rows or romances. Nevertheless, this is the first time anyone outside the development team has played the game, so it’s understandable that Two Point Studios would only be aiming to reassure, not dazzle. 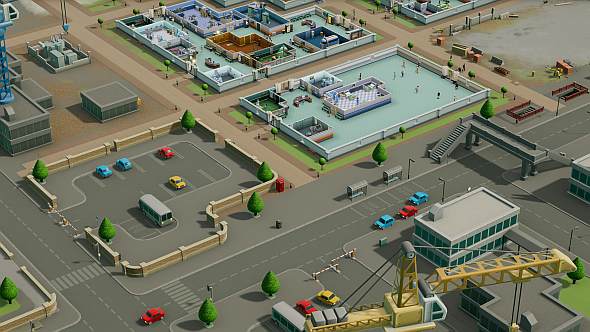 So far, it does a solid job of updating Theme Hospital for the modern era. If you’re unfortunate enough to have missed the late ‘90s in PC gaming, that game was a landmark in management sims: an engaging game in its own right, but executed with a distinctive, wholesome humour – most notably its whimsically named fictional diseases – which influenced later hits such as RollerCoaster Tycoon and The Sims. All of that is still in place. There’s a disease called verbal diarrhoea and another called bed face. I nearly hired an assistant named Gwendoline Sausage for her name alone, and a doctor named Bruce Flogg because, according to his employment reference, he “tried to bring back capes.” Tannoy announcements and hospital radio DJs are a verbal conveyer belt of one-liners and low-key sass – “cured patients are advised to leave the hospital. Before they catch something else.” I could go on – this humour permeates the game at every level. Before I can open my hospital, I need an assistant to process inpatients and a GP to diagnose them. Treatment is next, and at the most basic level, means I need a pharmacy to dispense drugs. I’ve then got to consider the comfort of staff and patients, which means benches, snack machines, toilets, and a staff room with comfy sofas. More complex conditions need more advanced facilities to diagnose and treat, and a ward to quarter those who need long-term care. Getting all these cogs turning together smoothly has been the challenge and the joy of management sims since the genre’s inception, and it still scratches a certain itch when you diagnose and solve a problem in your own design. So, on current evidence, everything you liked about Theme Hospital is here. But Two Point Studios don’t want to be thought of as making ‘just’ a spiritual successor – they want to bring something new. I’m told that the game will “differentiate dramatically” when you get to later features such as marketing, the expansion into Two Point County, R&D, and staff training. Speaking of staff, those aforementioned personality traits are one of the biggest developments since Theme Hospital, and will (in theory) keep you on your toes by presenting a number of emergent challenges. A heartthrob nurse might prove an unhelpful distraction to a romantic receptionist, for instance. You can manage this by confining the nurse to a different part of the hospital, or perhaps by firing one of the two if you’re feeling ruthless. Besides the familiar ability rating, staff also now have qualifications that make them especially skilled at certain aspects of their job. Gwendoline Sausage, for instance, has the ‘bedside manner’ perk, increasing the happiness of patients she deals with. Presumably she gets this from her nametag alone. Later scenarios will also challenge you in their starting parameters. Variable climates will bring higher rates of certain diseases – and even be reflected in the clothing and disposition of your patients – and there is at least one scenario in which you’ll manage a state-run hospital. Patients here don’t pay, so you have other performance targets to hit, and you’ll need to do it from a fixed budget. 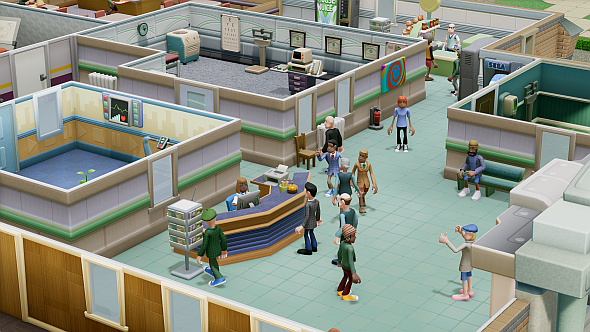 Whereas Theme Hospital essentially repeated itself in each scenario – albeit with more complex diseases and advanced equipment – these wrinkles in Two Point Hospital should stretch and bend the gameplay loop in interesting ways. But we’re not there yet. 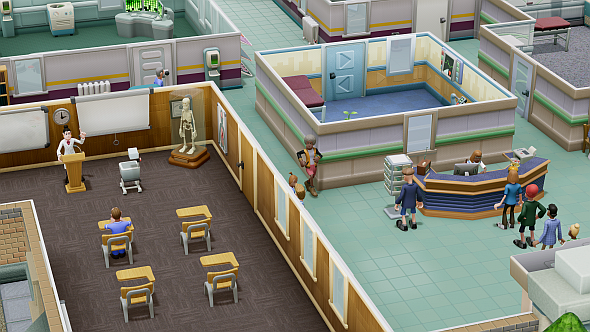 Two Point Hospital is still in alpha, and even in the tutorial, there are a few ways in which that shows. A bug recurs in which my nurses gradually gather in the ward and cannot leave, leading patients to queue outside unstaffed pharmacies. Later, I am told the drug dispenser in one of those pharmacies is broken and requires a janitor to fix, but when I drop a janitor into the room, a popup tells me there is no work there for him to do, and so he promptly leaves. There are also readability issues: some illnesses occur – such as lycanthropy and verbal diarrhoea – for which treatment consistently fails, and there are no tooltips or hints as to why. Staff ineptitude might explain one or two mistakes, but with several capable doctors working in my hospital, it’s unlikely to be the sole explanation for such a high failure rate. No-one wants the answers spoonfed (“you need to build and staff this particular machine”), but a bit of a steer (“you lack the correct facilities”) would be helpful. The devs are aware of this, and with the release date fixed only at some point this year, there’s plenty of time for polish. I’m told that, from here on out, everything is purely balance and bug fixing. The game is feature-complete, not content-complete. It’s reassuring to hear, especially when one considers this team’s experience, which reads like a tour of the UK games industry’s best and brightest studios: Carr got his start at Bullfrog back in 1989, where he worked on the original Theme Hospital alongside Mark Webley. Webley went on to co-found Lionhead Studios, which Carr later joined, as did Ben Hymers, whose 11-year career also includes stints at Rare and Creative Assembly. The three of them founded Two Point Studios in July 2016, which is when work on Two Point Hospital began, and it’s hard to think of a more qualified team to make this particular game. So far, Two Point Hospital is a reassuringly competent update of its iconic inspiration, with plenty of time and expertise on hand to iron out a few bugs and imbalances. For many, that will be enough – but, hopefully, we’ll soon get to see how the devs are aiming to surpass, rather than merely match, their own past work.